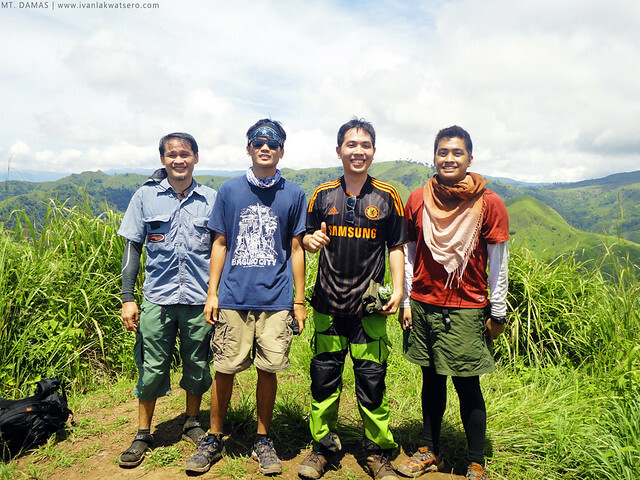 I, together with my blogger friend, Christine Fernandez of jovialwanderer.com, joined Pinoy Mountaineer and his friends in their Mt. 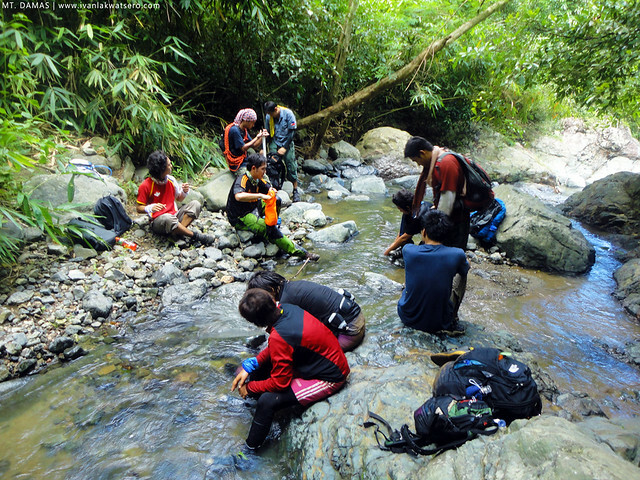 Damas Traverse Dayhike last Sunday (July 15, 2012). I am a big fan of Pinoy Mountaineer blog, so there's no reason for me to decline an invitation from him (sino ba naman ako para tanggihan ang isang Gideon Lasco). It was 12 MN, me and ate Christine decided to meet Gideon's group at MRT-Q.Ave. Both of us were excited, aside from the fact that it is our first time to join a hike arranged by no less than "THE" Gideon Lasco (woohh.. fan boy mode ako), it also served as our reunion climb (the last time I climbed with ate Christine was during my 2nd climb - Mt. 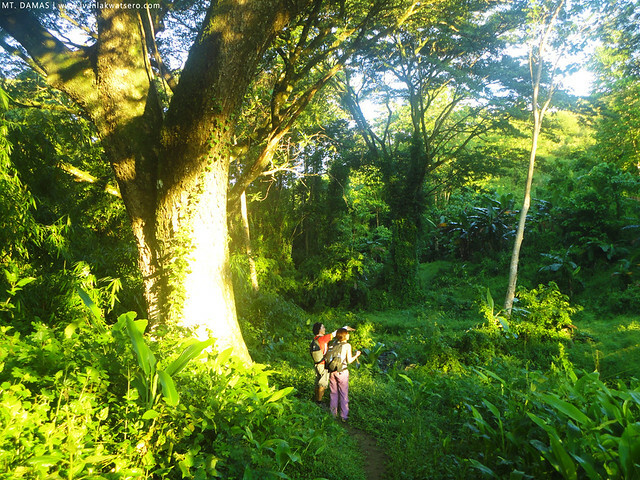 Maculot dayhike - wala pa akong kaalam-alam noon sa mountaineering, marami akong napulot sa kanyang techniques hence, I consider her one of my hiking mentors). 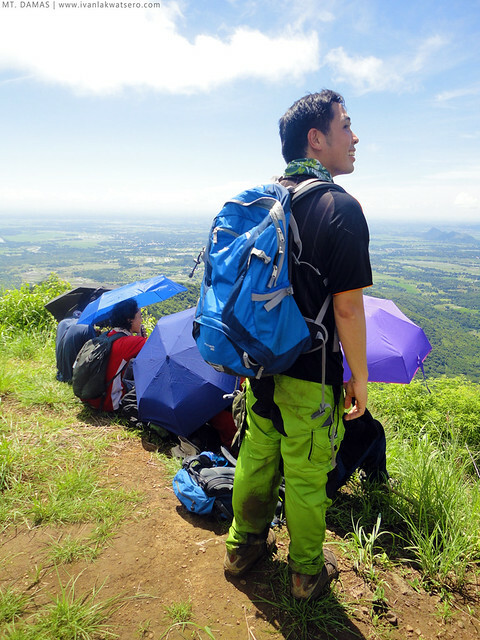 I did not bother reading and researching for this mountain, since we were with the master of hiking itineraries naman. At Camiling, Tarlac, four dudes from GAME-NEST joined the team. 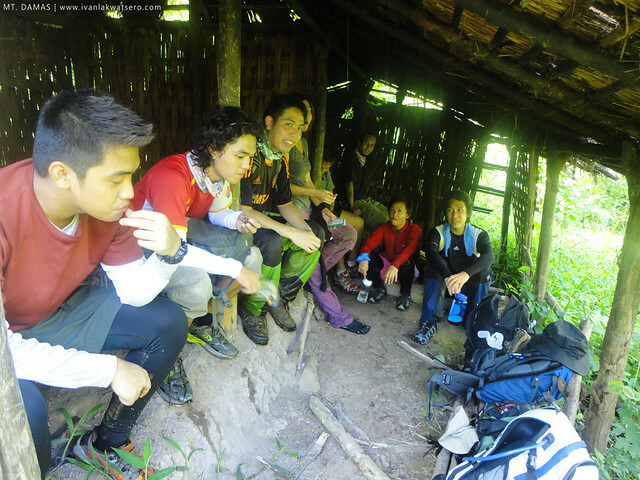 | GAME-NEST is a Tarlac-based mountaineering group that explored and created the trails to Mt. Damas. applause to them. We were supposed to ride a truck from Camiling town up to Sitio Dueg (the main jump-off), but the truck we were expecting did not show up. 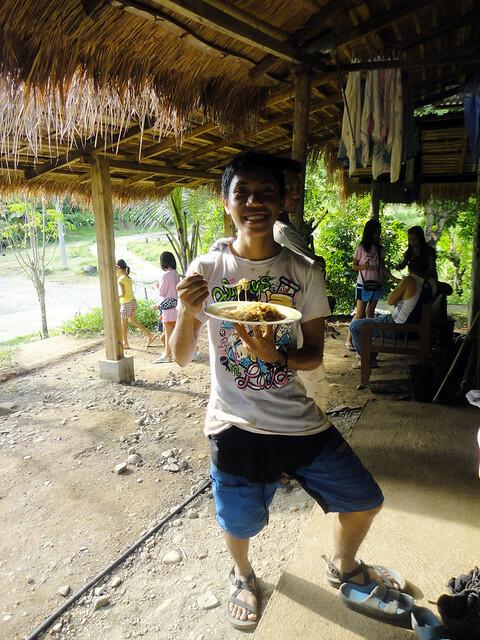 Thus, we were compelled to go to Brgy. Papaac (the alternate jump-off) to take the 2 hours longer route. 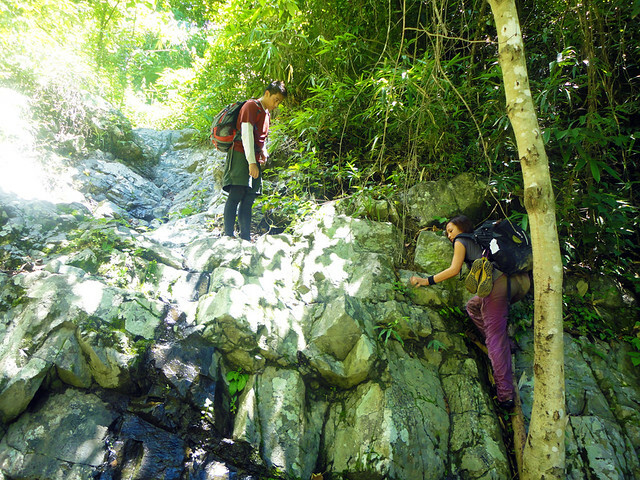 To start this historic dayhike (yup it is historic because according to GAME-NEST, we're the first team to attempt a traverse dayhike on this mountain), sir Emman of GAME-NEST briefed us on what we're going to expect on this mountain. His words sounded like a not-so-difficult hike, so I can't help myself but to underestimate Mt. Damas. At exactly 5:30 AM, our trek commenced. 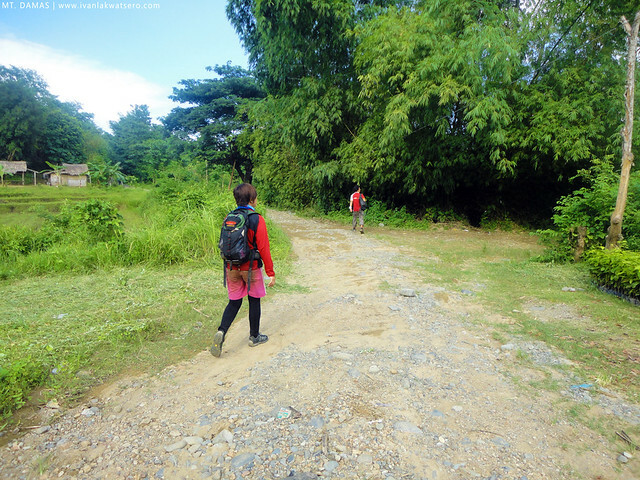 The first hour of the trek was undoubtedly very easy and trouble-free. The assault was gradual and the trail was very obvious, just the way like it. The trail was a bit muddy but that's just ok.
After about an hour, we stopped at this first hut, there's a water source nearby. The easy wide trail slowly narrowed as we approach the second hut (15 minutes away from the first hut). Past the second hut and the trail became a bit steeper and narrower. "Sana nag-suot ako ng arm warmers," I told myself as the trail also became abundant with tall blade-like talahib and thorny makahiya plant. 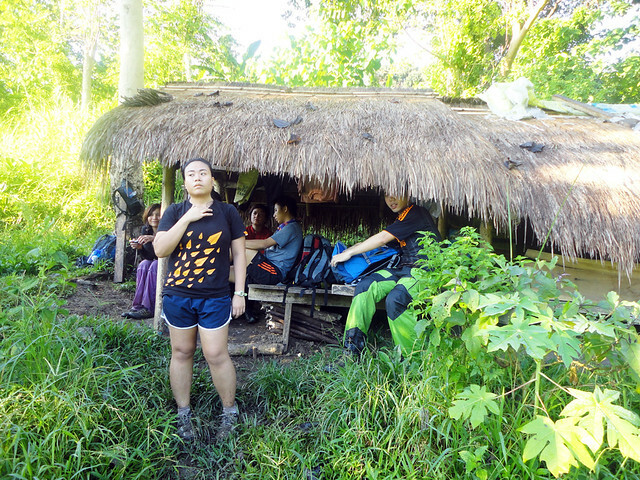 I felt so unwelcome on its trail - dahil nga I underestimated it. At the junction (left descending trail leads to Mt. 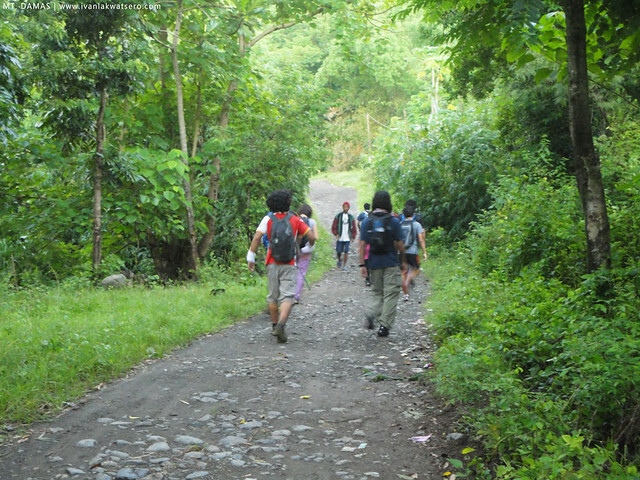 Damas; right ascending trail leads to Sitio Dueg) near the lonely mango tree, we met a family heading back to their home at Sitio Dueg. According to them, they came all the way from Pampanga by foot (yup, BY FOOT) because they have no money for fare. grabe lang. Accoring to Chad of GAME-NEST, they discovered Mt. Damas because of this tree. 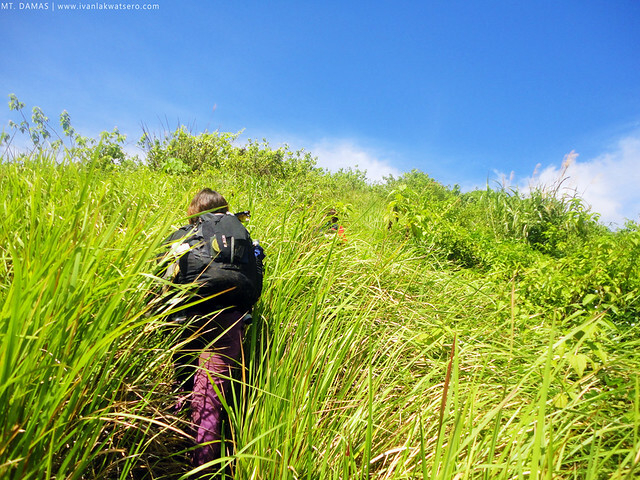 We continued trekking towards a steep and ma-talahib trail and reached the third hut in just 10 minutes. I checked my hands and arms, grabe lang, andaming cuts from the sharp talahib. It was 8 AM already, and we're blessed with a very good weather, not a single sign of rainy clouds showed up. 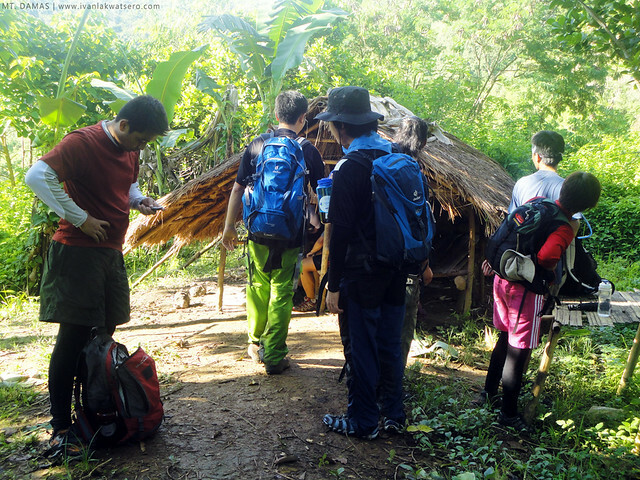 If I counted it right, we encountered a total of 6 huts throughout the traverse. 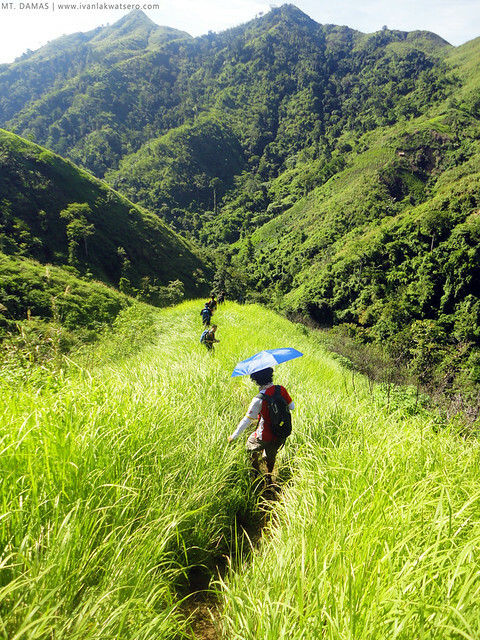 with the clear sky comes a very hot sunshine :) because of it, our trek became a bit more challenging. Buti na lang protektado ako ng aking sombrero. "Life is like Mt. Damas, full of ups and downs" - a quotable quote from doc Gideon. Because for like 2 hours and 30 mins, from the 3rd hut until the summit, the trail is full of ups and downs. Not just simple ups and downs but STEEP ups and downs lined with the tall talahib and a variety of thorny plants on all sides. Grabe lang talaga, mata mo lang ang walang latay mula sa mga talahib hehe... I promised myself never to go here again lalo na if full packed. 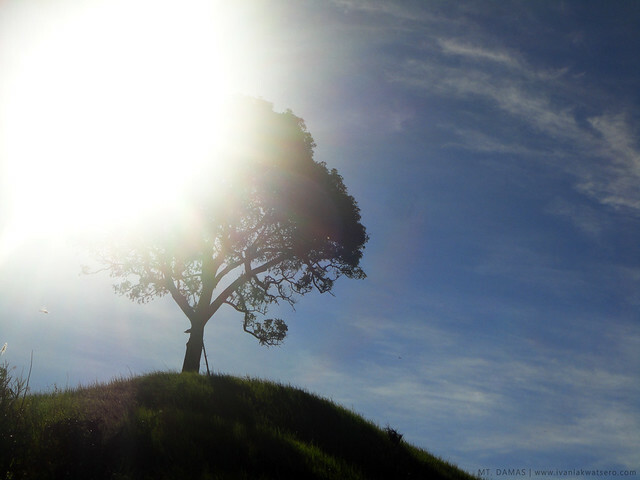 At 10:00 AM, the sun's heat was excruciatingly painful to skin. extra challenge. We rested for 5 minutes at the campsite just about 100 meters before the summit. Kanya-kanya kaming hanap ng masisilungan mula kay Haring Araw dahil SOBRANG INIT..
From that campsite, we trekked for about 5 minutes more to Mt. 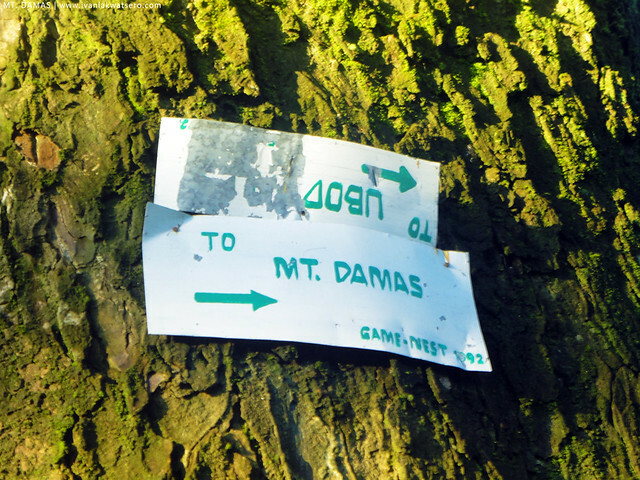 Damas Summit (685 MASL). The feeling was amazing as I reached my 17th summit. 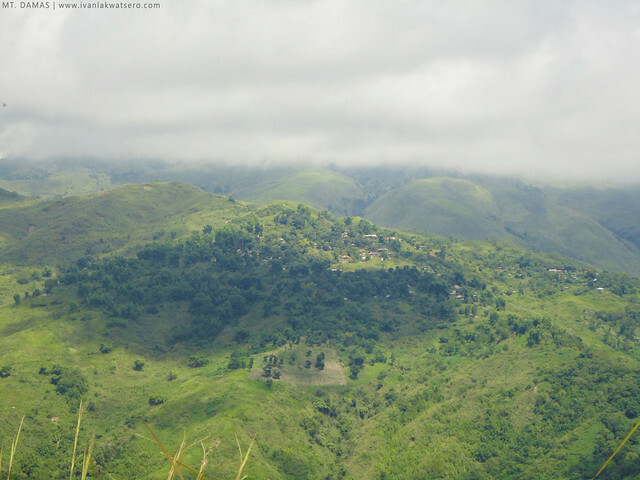 There's a great view of Tarlac plains and nearby mountain range. Syempre mega photo-ops kami sa taas, at madalian namin ginawa yun dahil SOBRANG INIT. Doc Gideon at the summit. Doc Gideon with the GAME-NEST dudes. Big thanks to them. After about 20 minutes, we descended to the other side of Mt. Damas, hindi na namin kinaya ang SOBRANG INIT. The trail was again, very steep and ma-talahib and matinik and the sun was shining brightly - it was a combo challenge. 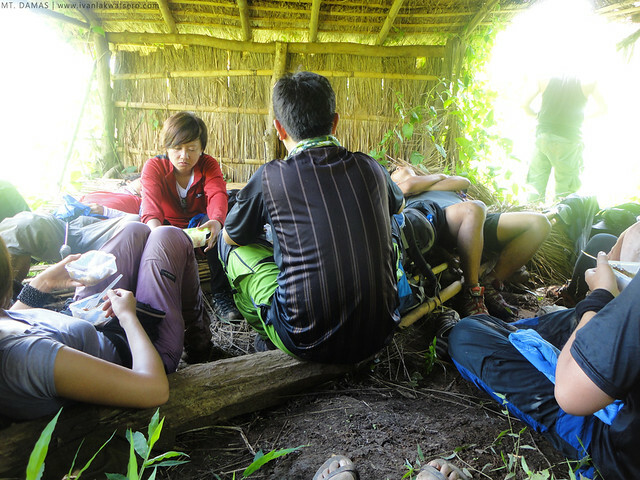 Then on the 5th hut (20 mins from the summit), we decided to stop for lunch and rest as well. Doc Gideon was even joking that he wants to steal my wide brimmed straw hat and bring it atop Mt. Amuyao. haha. Dapat daw mahirapan ako - kung alam mo lang Doc Gid, sobrang nahihirapan na ako sa Mt. Damas na ito, hehe. We spent about 30 minutes on that hut before we proceeded with the steep descent (again) towards a river. At the river, I washed my dirty hands and WAAAAAAHHH, ang hapdi!!! I noticed that my hands acquired an uncountable cuts and pricks from the hostile plants along the very steep trail. According to GAME-NEST, the falls was now a few minutes away. 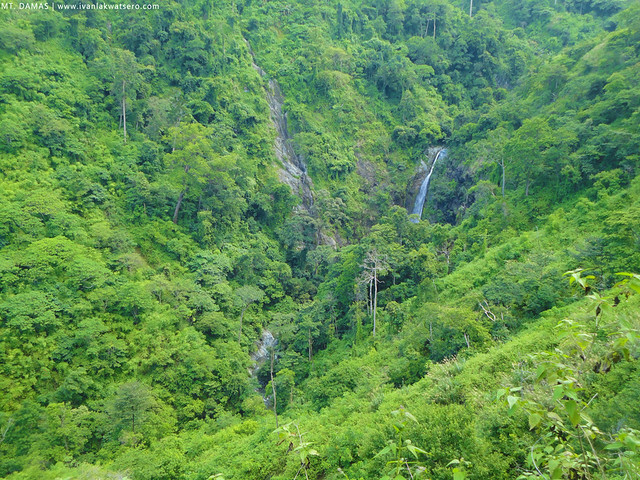 and vwalla, Ubod Falls at last, so high so great. 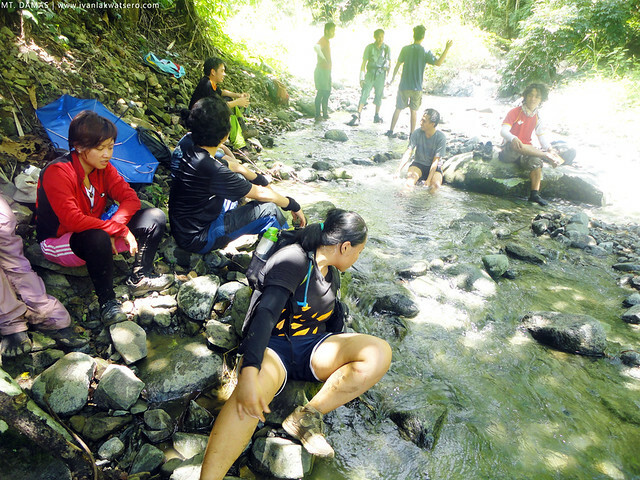 Some of us chose to rest under the shade of the trees, others chose to feel the cascading waters of Ubod Falls. Well as for me, I decided to dip my feet in the flowing river and wash my cuts and scratches. ang hapdi lang sobra. At around 2 PM, we decided to carry on with the trek to complete the Papaac-Papaac Circuit. 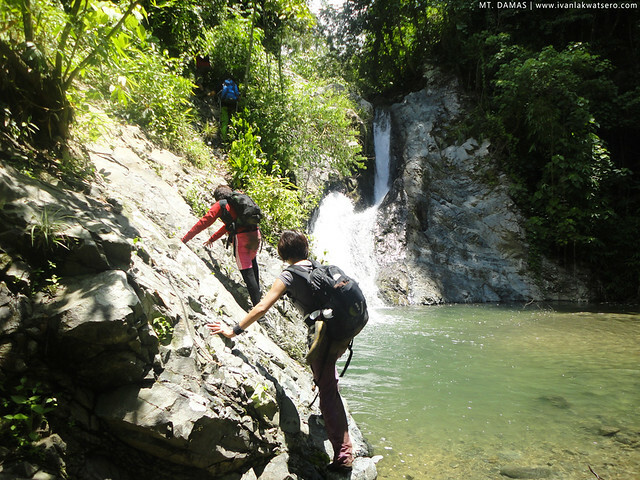 I really thought the trail beyond Ubod Falls wouldn't be as hard as the previous ones, but I was so wrong again. Just 10 minutes from the falls, we ascended a very steep trail. 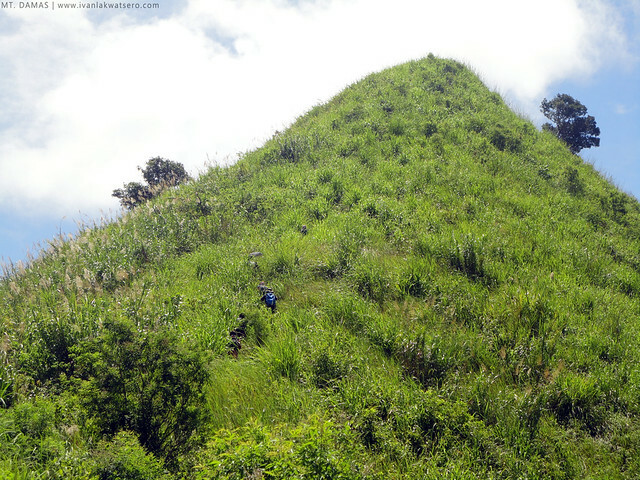 It was so steep that the mountaineers started calling it the "Cardiac Trail". 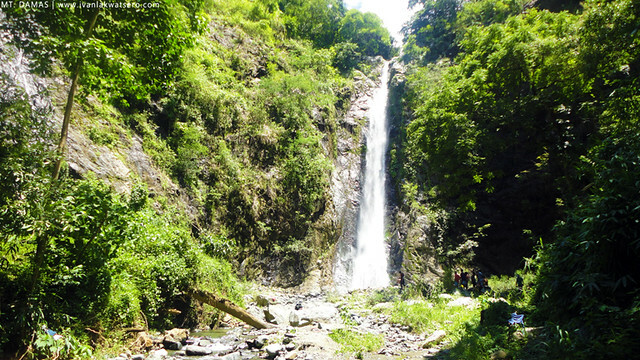 buti na lang merong great view ng Ubod Falls from the trail. The very steep ascent on the "Cardiac Trail" was soon followed by a very steep descent. Nabasag na ata ang tuhod ko, sobrang nanginginig. So I decided to sit on the entire length of the steep trail. Slide kung slide, wala na akong pake. A river marked the end of the steep trail, ugh thank goodness. For the next 20 minutes, we did river trekking. Then for the final leg of the Papaac-Papaac circuit, we assaulted the seemingly Mother Nature's final line of defense. We had no choice but to take this lone trail full of thorny bushes and tall blade-like talahibs. Beneath our feet was an army of ants willing to give you the itch you'll never wish to experience (up until now as I write this article, sobrang kati pa rin nung mga kagat ng langgam sa hita ko)... Mother Nature simply put up her vilest defenses on this last leg of the traverse. 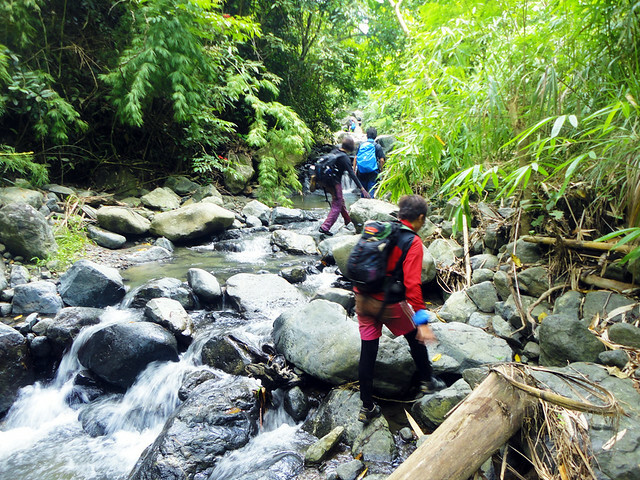 Past this extreme trail, we're back at the easy trail to Brgy. Papaac. And by 4:00 PM, we're back to Brgy. Papaac, Mt. Damas Traverse Dayhike is now completed. it took us 10 hours and 30 mins to complete the first ever traverse dayhike on this mountain. Congrats to us. To celebrate our success, GAME-NEST treated the whole group with pancit, ice cold softdrink and a yummy tinola dish. 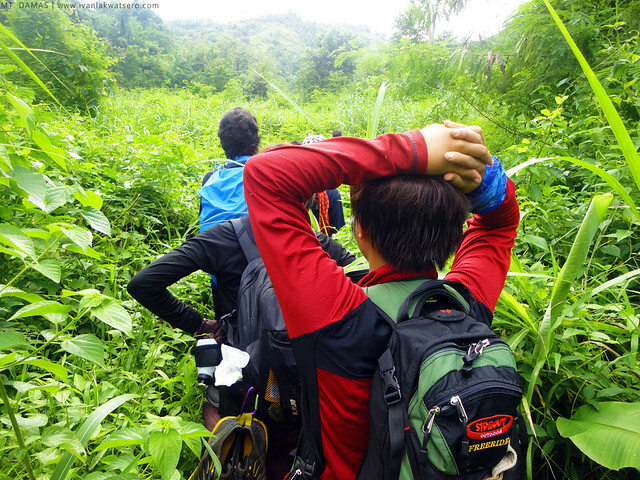 My big thanks to Pinoy Mountaineer for inviting me in this awesome dayhike, sobra po akong na-challenge. 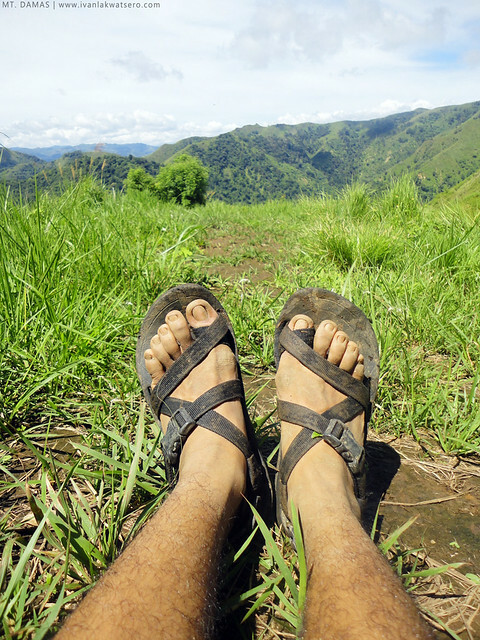 Read Pinoy Mountaineer's Hiking Matters #282. To GAME-NEST dudes, thanks for guiding and hosting the whole group, you guys rock also. Mukhang sobrang challenging! At exciting! Ramdam ko yung init, grabe basang basa kayo sa pawis. haha! 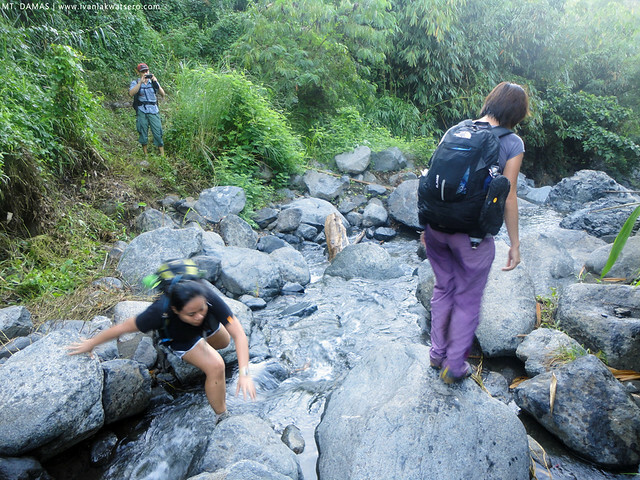 been there last year, umuulan, grabe hirap nmin sa bundok yan. Ivan, ang ganda ng mga pictures ha, maganda din naman kc yung bundok but props sa eyes, hands, & artistic mind mo, it's not at all surprising na ma-invite ka ni sir Gid (today's proponent of responsible mountaineering sa bansa natin & for Filipinos internationally). 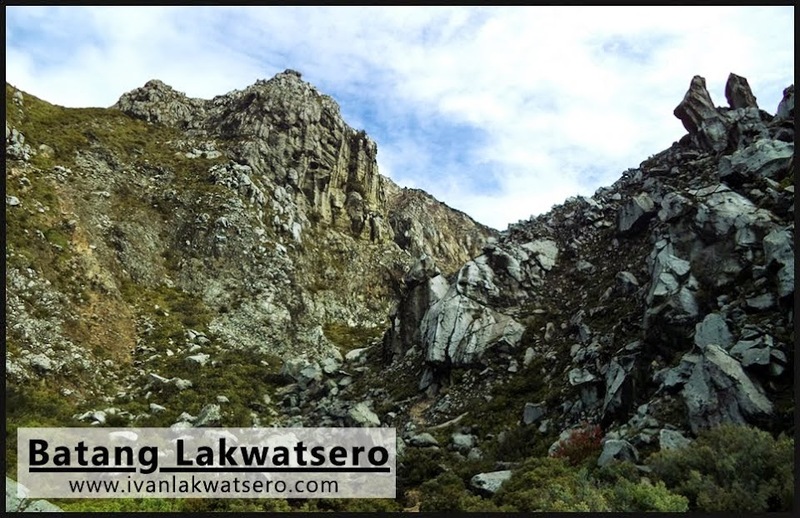 I know sir Gid knows na malaki din ang mai-share mo sa mountaineering community through your blog. salamat sa iyong kind words sir Joni..
Parang mahirap nga hehe! Siguro after 10 easy climbs saka ko pa makakaya to hehe! i'm telling you.. this is my hardest trek yet. 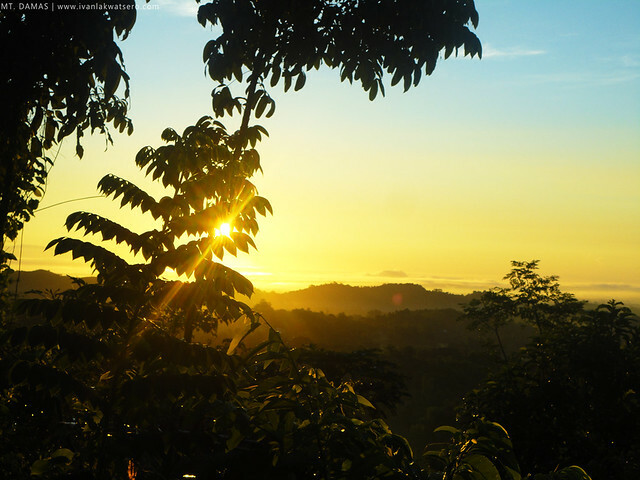 thanks.. kaya pa yan, habang may buhay may chance pa.. let's trek!!! yup. yan din naisip ko nung una ko syang nakita, antakad nya. haha. oks lang yun.. andami naman nating napag-chismisan e.
tara, samahan ko kayo mag-arayat. parang ansarap makijamming sa inyo. promising ang bundok na yan sir! Ang Sarap talaga mamundok... Sana this August maakyat na kita Damas... Salamat sa mga ganitong blog, kayo ang nagiging guide namin sa pag-akyat. 1st, id like to commend you for this easy to read blog...loved it, especially your interjections of Filipino words. I was entertained. Along with that i now have an idea of my Damas. I thought its a major hike. i'll be climbing with Base Kamp Alimall on the 22 Nov...but not a day hike. we will get there on early morning of 23 Nov then come down on the 24th. 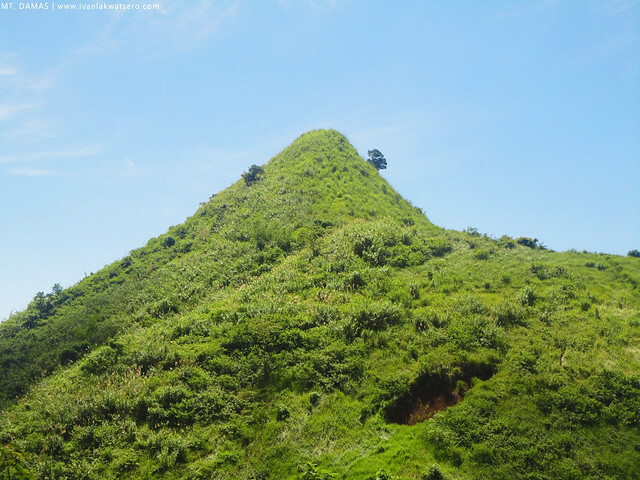 Thanks again for this simple yet informative blog about Mt Damas. twas a short yet informative blog...nice ay of interjecting Filipino to English sentences...making it less formal. Loved the way i can feel as a climber what you are describing. My plani s on Nov 22 with the Base Kamp..bt definitely not a day hike. 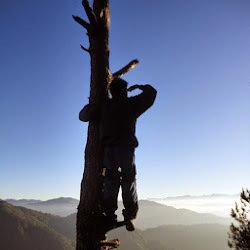 buti nalang nakita ko ito, I am also a fan of The Pinoy Mountaineers blogsite, and I always check their site for every future climb na makakasama ako, kaya lang sa Mt. 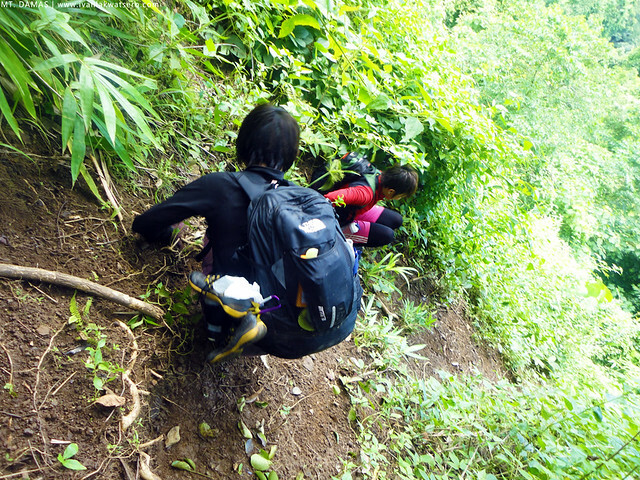 Damas climb nila hindi ganun ka kompleto yung detalye ng trail, thanks to you , kaya pala sinabing major climb na ito .. hehe .. more climb sir!! Wahhh nakakaiyak sobra! Will not come back here again and will indefinitely retire from climbing (I'm a 55 yr old mom). Did a day hike with my son on December 28, 2015.